Key messages: Pincer nail being a resistant condition does not respond to conservative methods, especially in advanced cases, and recurrence is very common following these conservative techniques. Surgical techniques, which aim at widening of nail bed along with the removal of osteophytes, are recommended for advanced pincer nail. Three-flap technique provides a satisfactory outcome in treating pincer nail. Pincer nail deformity is characterized by transverse overcurvature of the nail that increases distally. In the past, pincer nail deformity was considered a type of ingrown nail rather than being clearly classified as a separate disease. It was first described by Cornelius and Shelley in the year 1968. The transverse overcurvature results in impingement of distal nail bed between the free lateral edges of the nail plate leading to a narrow nail bed, which many a times can be painful. Various conservative and surgical treatment modalities have been developed for this condition. Conservative techniques, such as nail grinding, nail brace, and application of urea paste, are simple and easy to perform but are associated with high rate of recurrence. Thus, surgical modalities are considered when long-term results are required, especially in advanced cases of pincer nail. 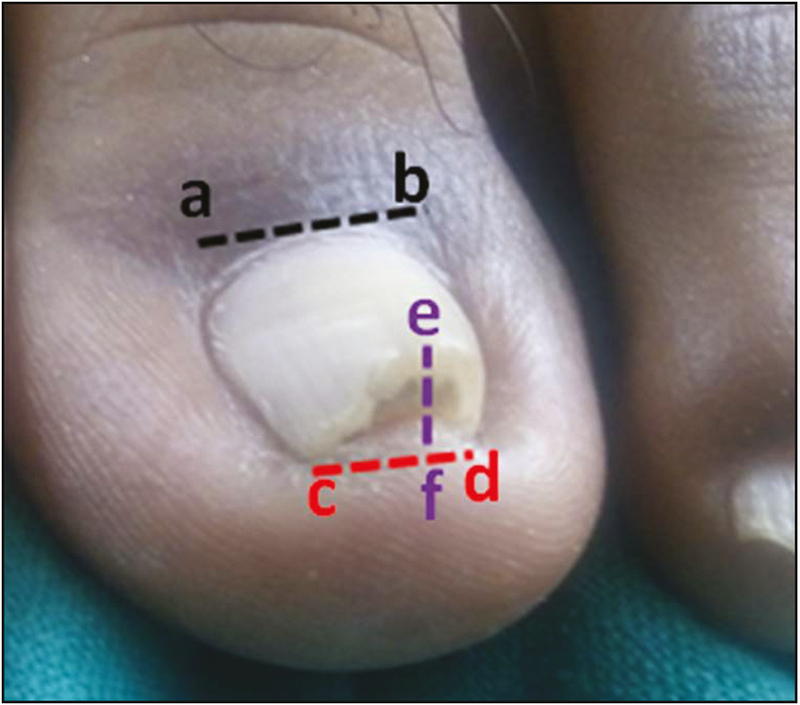 Fifteen male and female patients presenting with symptomatic pincer nail deformity of toe, seeking treatment in the department of dermatology, venereology, and leprology of a tertiary care center from June 2016 to December 2017, fulfilling inclusion and exclusion criteria were enrolled for the study. Patients aged >18 years with acquired or hereditary pincer nail involving toe nails, willing for surgical treatment were included and patients aged <18 years, not willing to give consent, with unrealistic expectation and comorbid conditions, such as psychiatric illness, uncontrolled diabetes mellitus, peripheral arterial disease, and onychomycosis, were excluded from the study. Routine X-ray was taken for all patients to detect underlying bony abnormalities such as exostoses. The nail plate evaluation was carried out by measuring the widths of the nail root and nail tip and the height of the nail tip, followed by calculation of the width and height indices [Figure 1]. The width index is defined as the percentage ratio of the width of the nail tip to the width of the nail root (cd/ab × 100), whereas the height index is defined as the percentage ratio of the height of the nail tip to the width of the nail tip (ef/cd × 100). The aforementioned measurements are taken before and 1 year after the surgical treatment. A digital block was performed by injecting 1% lidocaine, and a rubber tourniquet was applied [Figure 2]A–H. The deformed nail plate was removed from the great toe by using an elevator without inducing nail bed injury. After exposing the nail plate, an inverted Y-shaped incision is placed in such a way that the vertical limb was placed on nail bed and two slanting incisions on distal nail fold. Later, nail bed would be separated from underlying bone, thus raising three flaps, two from nail bed and one from distal nail fold, and exposing periosteum. Periosteum was palpated with the gloved finger for bony outgrowths and irregularities. Using a motorized metallic burrs (no. 703), bony irregularities were leveled. After bony correction, the three flaps were repositioned in such a way that the third flap from distal nail fold was interpolated in between nail bed flap, thus widening the nail bed [[Figure 3], which was sutured with 3-0 Vicryl. This was followed by the application of tubular dressing. In immediate postoperative period, the patients were advised antibiotic and analgesics. They were followed up on 3rd day to check for any post-op complication and at 6 months and 1 year to assess the outcome. Of the 15 patients enrolled, nine were females and six males. They were in the age group of 22–58 years. Family history was reported in 12 patients and in three patients, no cause could be found. In hereditary cases, all 10 toe nails were involved unlike the acquired causes where only great toe nails were involved and in two cases, they were bilateral. Seven were of trumpet type, six were of tile type, and only two were of plicated type. X-ray examination revealed osteophytic growth only in three patients, rest showed no radiological abnormalities. Of 15 patients, 11 sought treatment because of pain and rest four for cosmetic purpose. All the patients were subjected to total nail avulsion followed by nail bed correction with aforementioned three-flap technique and motor dermabrasion. The preoperative width of nail root ranged between 14 and 16mm, the average being 15.2±1.5mm. Width of the nail bed at the tip varied between 4 and 9mm, the average being 8.2±1.3mm. Height of the nail plate varied between 4 and 6mm with the average being 5.6±1.1mm. Average width indices and height indices preoperatively were 53.9±8.8 and 68.04±23.3. At 6-month follow-up, partially grown nail plate was observed in patients. The measurements and indices calculated at the end of 1 year showed the same average width at the root, that is, 15.2±1.5mm, average width at the tip was 13.5±1.2mm, and the average height at the tip was 2.2±0.9mm. 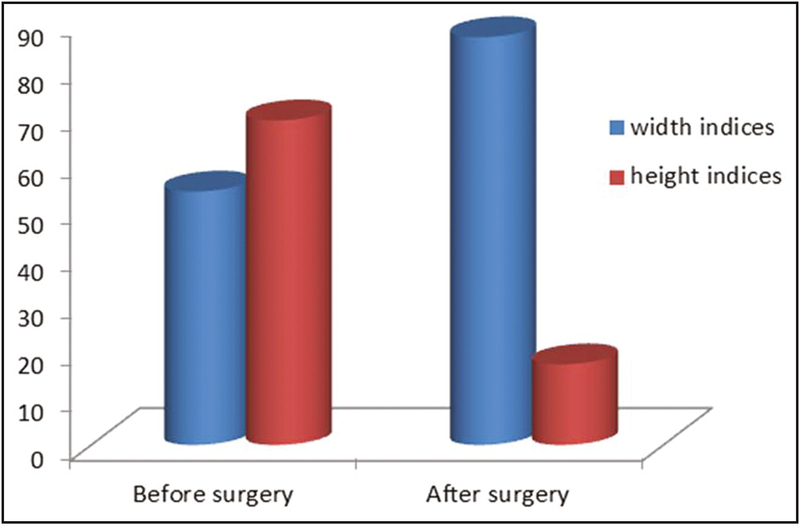 The average width and height indices were 88.8±2.3 and 16.29±5.2, respectively, in the postoperative period [Table 1] [Figure 4]. Results were analyzed using paired t-test method and P value of <0.0001 (P < 0.0001), which was considered statistically as extremely significant. Postoperative pain was significant in all patients and persisted for about a week. At the end of 1 year, significant flattening of nail plate was observed in all the 15 patients. However, one patient had nail plate discoloration and roughening, which resolved in the next 6 months. One patient showed asymptomatic onycholysis at the distal end [Figure 5]C. This may be attributed to interposing of keratinized flap from hyponychium at which growing nail fails to attach to nail bed. The term “pincer nail” was proposed by Cornelius and Shelley. Hereditary and acquired cases have been disclosed as etiological agents. The acquired causes include arteriovenous fistulas, medications, and Kawasaki disease. In acquired cases, the shape of the ungual plate returns to normal whenever the problem disappears. On the basis of shape of the incurving nail, pincer nails are classified into three types [Figure 6], that is, trumpet type in which the lateral plate margins virtually roll in, sometimes forming a tube; tile-shaped nail, characterized by an even transverse overcurvature with the lateral nail edges remaining parallel; and plicated type with moderate convexity with lateral plate edges being sharply bent to form a vertical sheet pressing into the lateral nail groove. The anatomical abnormalities associated with pincer nail were studied by Jung et al. and include transverse overcurvature of the nail plate, narrowing of nail bed as we move from proximal to distal end and the associated bony changes include enlarged basal width of distal phalanx and osteophytes, thus increasing the bed curvature. Many conservative and surgical treatments have been proposed. Treatment options can be divided into three groups: The first category being conservative methods such as nail grinding, nail brace, urea paste, and nickel–titanium wires. Disadvantages being temporary relief with high recurrence rate. Second category includes minimally invasive surgical modalities without bone and nail bed corrections such as avulsion of the ungual plate, total destruction of the matrix, unilateral or bilateral matricectomy, and CO2 laser use. Third category includes aggressive surgeries with bone correction in which ungual bed is detached from the bone, bone correction is carried out, followed by replacement of the bed with grafting, if necessary and the widening of the bed through the removal of the skin from the finger’s lateral and front faces through the Dubois procedure. Other bed-widening techniques include removal of a large amount of wide “U”-shaped skin from the digit’s lateral and front faces, with healing by second intention, including the portion removed from the bed. In all these techniques, the healing is delayed, contributing to prolonged post-op discomfort to patient. Other flap techniques are five-flap techniques, which are difficult to design five flaps in narrow area of working and inverted T technique, which aims at correcting bony outgrowth without altering the nail bed width. Though several techniques are described in literature, very few are based on objective measurements. Lee et al. in their study have shown an improvement from 72.7±13.0 to 87.4±10.5 and from 58.8±29.1 to 26.0±12.7 in width and height indices, respectively, in the postoperative period, using nail-grinding technique. In another study by Moon et al., which used a modified Haneke’s method, the preoperative mean width and height indices of 15.4 and 63.9 improved to 87.1 and 11.9, respectively. Jung et al. evaluated the outcomes of two techniques: zigzag nail bed flap technique and inverted T technique. With the zigzag nail bed flap technique, preoperative mean width index of 60.4±10.1 increased to 90.6±3.1, whereas the mean height index decreased from 85.4±30.4 to 25.0±6.3. Similarly, with inverted T technique, preoperative mean width index of 59.3±14.7 increased to 88.5±4.2, whereas the mean height index decreased from 75.6±29.3 to 21.0±4.4. Our study also showed an improvement in width and height indices of 53.9 and 68.04 in preoperative period to 88.8 and 16.29 in the postoperative period, respectively, which is comparable to other studies. All procedures have their own pros and cons. For cases that are diagnosed early, less aggressive treatments may be successful. For more severe cases with large angle changes, however, more aggressive treatments are appropriate. The advantage of three-flap technique is that it takes into consideration the anatomic abnormalities associated with pincer nail, that is, interpolation of the third flap in between the two flaps results in widening of the nail bed distally. And once the flaps are raised, distal phalanx is accessible for correction so that any bony outgrowths and irregularities can be leveled with motor dermabrasion. Also in our study, we found that all types of pincer nail, that is, trumpet [Figure 5], tile [Figure 7], and plicated type [Figure 8] responded well with good cosmetic outcome and relief from pain. Drawback of this procedure is that it is a highly aggressive technique requiring surgical skill and cannot be used in patients with poor-healing capacity such as those with old age, uncontrolled diabetes, and arterial insufficiency, where more conservative techniques are preferred. To conclude, three-flap technique offers an effective surgical modality in the management of pincer nail. However, sample size being small and follow-up period being only 1 year, further studies are needed with large number of patients with long-term follow-up period. Cornelius CE 3rd, Shelley WB. Pincer nail syndrome. Arch Surg 1968;96:321-2. Mimouni D, Ben-Amitai D. Hereditary pincer nail. Cutis 2002;69:51-3. Hwang SM, Lee SH, Ahn SK. Pincer nail deformity and pseudo-Kaposi’s sarcoma: complications of an artificial arteriovenous fistula for haemodialysis. Br J Dermatol 1999;141:1129-32. Greiner D, Schöfer H, Milbradt R. Reversible transverse overcurvature of the nails (pincer nails) after treatment with a beta-blocker. J Am Acad Dermatol 1998;39:486-7. Vanderhooft SL, Vanderhooft JE. Pincer nail deformity after Kawasaki’s disease. J Am Acad Dermatol 1999;41:341-2. Baran R, Haneke E, Richert B. Pincer nails: definition and surgical treatment. Dermatol Surg 2001;27:261-6. Guéro S, Guichard S, Fraitag SR. Ligamentary structure of the base of the nail. Surg Radiol Anat 1994;16:47-52. Plusjé LG. Pincer nails: a new surgical treatment. Dermatol Surg 2001;27:41-3. Gourdin FW, Lang PG Jr. Cylindrical deformity of the nail plate secondary to subungual myxoma. J Am Acad Dermatol 1996;35:846-8. Theunis A, Andre J, Forton F, Wanet J, Song M. A case of subungual reactive eccrine syringofibroadenoma. Dermatology 2001;203: 185-7. Jung DJ, Kim JH, Lee HY, Kim DC, Lee SI, Kim TY. Anatomical characteristics and surgical treatments of pincer nail deformity. Arch Plast Surg 2015;42:207-13.
el-Gammal S, Altmeyer P. [Successful conservative therapy of pincer nail syndrome]. Hautarzt 1993;44:535-7. Zadik F. Obliteration of the nail bed of the great toe without shortening the terminal phalanx. J Bone Joint Surg 1950;32:66-7. Iida N, Ohsumi N. Treatment of severe deformities of the toenails by the modified Zadik method with artificial skin. Scand J Plast Reconstr Surg Hand Surg 2004;38:155-9. Lane JE, Peterson CM, Ratz JL. 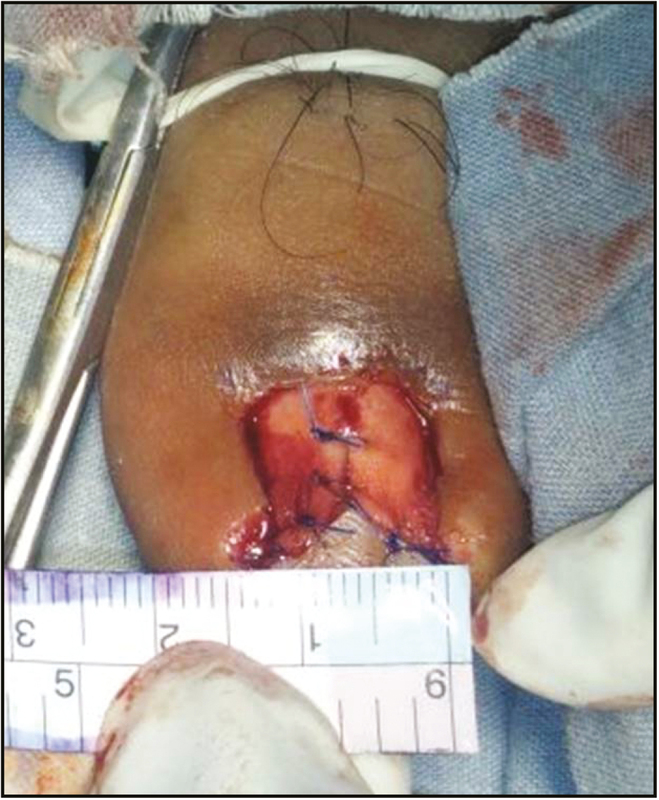 Avulsion and partial matricectomy with the carbon dioxide laser for pincer nail deformity. Dermatol Surg 2004;30:456-8. Dubois JPH. Un traitment de l’ongle incarné. Nouv Presse Méd 1974;31:1939-40. Rosa IP, Garcia MLP, Mosca FZ. Tratamentocirúrgico da hipercurvatura do leitoungueal. An Bras Dermatol 1989;64: 115-7. Lee JI, Lee YB, Oh ST, Park HJ, Cho BK. A clinical study of 35 cases of pincer nails. Ann Dermatol 2011;23:417-23. Moon HS, Son SJ, Park K. A clinical study of efficacy of surgical management for pincer nails. Korean J Dermatol 2009;47:509-15.